This is also one of the delicious specialties famous for tourists on Vietnam food tours coming to Hoi An. This cake has been favored by Western tourists and called with the beautiful name of “white rose” because of its small shape like a flower with pure white color of steamed rice flour. The bun from steamed glutinous rice flour, the ingrdients inside include pureed shrimp meat with fresh mushrooms, bean sprout, onions and served with fragrant fried onions. 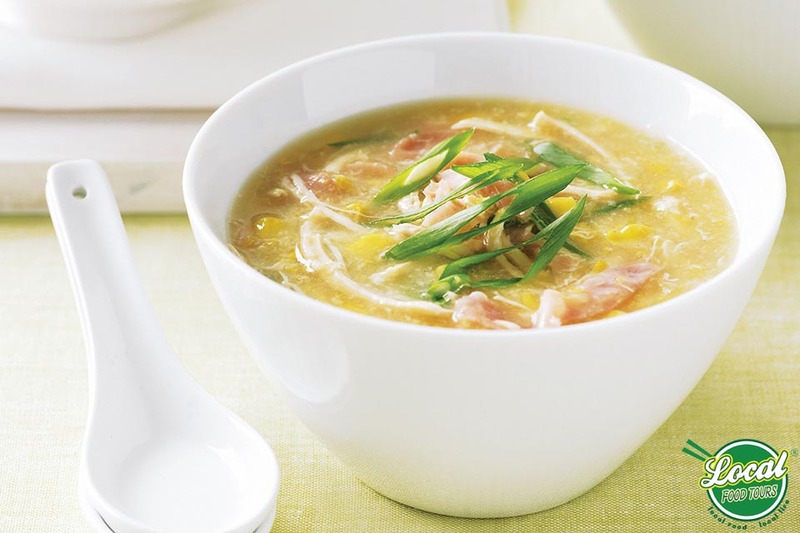 If you have tasted savoury dishes, visitors can try the delicious corn sweet soup of ​Hoi An. Corn sweet soup is cooked from the corn of Cam Nam, which is fragrant and well-known in Hoi An. The fresh corn is picked and then cleaned corn husks and whiskers, boiled to get sweet corn juice. Then people will remove the corn from the cob. The bowl of corn sweet soup is visually smooth, transparent with the bright yellow color of corn seed, which makes tourists want to just enjoy it right. In order to increase the sweet aroma for corn tea, people often sprinkle on sweet soup a little bit of greasy and viscous coconut milk. When eating, mix the sweet soup with coconut milk to feel the full attractive aroma of corn blended with the attractive aroma of coconut milk. To enjoy delicious Hoi An corn sweet soup, visitors on food walking tour can visit the famous Old Lady’s shop with banh dap which is mentioned in part 1 to simultaneously taste the two delicacies typical of this idyllic Hoi An land. Tourists come to Hoi An often say that if coming to Hoi An but not yet enjoying the lemon teacup and sipping some green bean cakes, it is really wasteful. Green bean cake is a familiar dish of Vietnamese people throughout the three regions, but each land will have its own imprints and flavors, and so will Hoi An green bean cake. The difference of the cake here is that the cake when compressed into shape, will not be steamed like usual but will be baked. How wonderful it is that among the peaceful space of the old town, with a cup of cool tea, visitors can enjoy the fragrant sweetness of baked green beans cake. For the people of Quang Nam or many tourists, Hoi An green bean cake often tops the list of Hoi An specialties, so it is bought as a gift for those who go far away or for tourists who want to bring some Hoi An flavor to family and friends. With beautiful decorative packaging and delicious taste, this specialty is an indispensable gift in the backpack of visitors after the memorable trip. If Binh Dinh Quy Nhon land has the famous Bau Da liquor, when it comes to Hoi An, Quang Nam cannot help mentioning the famous Hong Dao wine. People in Quang Nam in general and Hoi An in particular are proud of the land and specialties here, including Hong Dao wine. Hong Dao liquor has long been a precious gift of Hoi An for both domestic and international visitors on Vietnam food tour. It would be great if you come to Hoi An – Quang Nam to travel and bring friends to give you a bottle of Hong Dao warm wine, a gift that has been associated with this land. Copyright © 2016 Hanoi Local Food Tour. All rights reserved.